Health / Nutrition / What’s Wrong with High Fructose Corn Syrup? High Fructose Corn Syrup was introduced into the American Food Supply in the 1970’s, at roughly the same time as partially hydrogenated oils. Since then, we’ve had epidemic levels of obesity, the highest rates of disease, and the lowest life expectancy of any industrialized nation. Those facts are not a coincidence. Politicians love to talk about how we have “the best health care system in the world”. If that’s true, it’s because we need it — and because many families spend every last dollar they have fighting the ravages of heart disease, cancer, diabetes, and autoimmune illnesses. In many cases, people spend the last several years fighting to stay alive — but not really living. That is not the way that things should be. The science of trans fats has been known for decades — since the 50’s, in fact. So there is no excuse for the fact that American corporations put it into the food supply in the 70’s. Nor is there any excuse for putting high fructose corn syrup into the American food supply — a substance whose science has a similarly long history. It is no excuse that the FDA has been so starved of funding by tax loopholes that now is now virtually a non-entity, funded by the very corporations it is supposed to regulate. It is no excuse that partially hydrogenated oils are cheaper than butter, and high fructose corn syrup is cheaper than sugar. Profit is no excuse for human misery. Otherwise, theft and fraud would be legal. In short, it is clear that both partially hydrogenated oils and high fructose corn syrup should be illegal. They are that deadly. The problem is, they do not kill quickly. If they did, there would be an uproar. Even businesses would be in an uproar — because about the only true crime you can commit in corporate America is killing customers quickly. Unfortunately, killing people slowly and causing untold suffering in the process is not a real crime, in corporate eyes — because such people are a profit center every step of the way. And if legislators are asleep at the switch, who can blame them. We have a political system dominated by the media. Without money, politicians get nowhere. Corporate conglomerations have most of the money in the world. They pay the politicians to listen. Without it, politicians have no future, so they listen. Meanwhile, those conglomerates pay lobbyists — 90,000 of them. We the people have several hundred “representatives” in Congress, and corporations have 90,000 lobbyists. Lobbyists write 90% of the legislation that our representatives vote on. So who is better represented? So if the FDA isn’t policing the food supply and legislators aren’t protecting it, how do you stay healthy? The answer is “personal responsibility”. Now, I don’t happen to believe that you are personally responsible if someone punches you in the nose. On the contrary, I believe that the person throwing the punch is more than a little responsible. Personal responsibility is an important principle, of the course, but the corporate shills who preach that doctrine use it to evade corporate responsibility. And because politicians are taking their money, they have been remarkably effective at it — so that fact is, they have created a world in which “personal responsibility” is the law of the land, like it or not. Valued correspondent Nick Eddy reports that the predecessor of the FDA was the Bureau of Chemistry, which safeguarded the food supply solely on behalf of American Citizens. The FDA was formed at the insistence of food manufacturing corporations, who argued that they “lacked a voice”. That argument has clearly been exposed as sheer folly. Today, food manufacturers not only have a voice, they provide the funding (or lack of it) so the FDA limps along, filled with caring people who lack the wherewithal to do their job properly. Someday, I would like us to improve the election process so that we get a government which, as a whole, is truly working for the good of the people. I’ve written up the things we need to do in Political Reforms America NEEDs. Until then, you and I need to arm ourselves with knowledge. We need to inform ourselves and inform our friends. We need to give talks whenever and wherever we can. We need to skim labels for the keywords that mean “poison”, and avoid the fast foods that contain those ingredients. We need to boycott foods that cause problems. We need to raise awareness. If we do that, we can restore American health, and reduce America’s waistline. If we don’t, we and the people we know will pay the price. It’s a lot to ask, I know. By rights, life should be easier than that. We should be able to walk into a grocery store or fast food restaurant, confident that anything we eat will not subtract from our prospects for longevity and a life that is free of disease. But until that day, we have to read labels. I once met a woman in a checkout line who said she was “ashamed to say that she never read labels”. I told that she should not be ashamed. It is the people who put those ingredients into the food supply that should be ashamed. But until they acquire a minimal sense of ethics, and until government regulations catch up to science and get enforced, the only thing you can do is avoid the products that hurt you, and hope that corporations get the message. That process does work. Some would claim that is the nature of capitalism, and that it represents capitalism “at its best”. I would claim that the time lag built into that system is immensely destructive. How many hundreds of thousands have suffered and died in the last 30 years? Or is it millions, by now? That’s capitalism working? I don’t think so. We have laws against fraud and theft, to help ensure that as people work for a profit, they are doing so in ways that benefit society. That is when capitalism works. Glucose has none of the problems associated with fructose. Starch molecules break down into glucose. Cane sugar is sucrose, which breaks down into an a 50-50 blend of fructose and glucose. But high fructose corn syrup is a blend of from anywhere between 55% and 80% fructose, with the remainder glucose. It is those high levels of fructose, unaccompanied by vitamins, minerals, fiber, or enzymes, which cause the damage. Virtually all non-organic corn, soy, and wheat grown in the United States has been genetically modified. Is it safe for humans? We don’t really know. There have been precisely no long term studies. How could there be? It hasn’t been around that long. When you consider that it could take as long as 30 or 40 years for health problems to show up, you realize that we are the long-term experiment that will find out if it is safe. Personally, I decline to participate, thank you very much. The European Union has declined to participate, too. They’ve banned imports of corn, soy, and wheat from the United States. So its the American people who are the subject of the experiment. And everyone who doesn’t devote themselves to a study of health and nutrition is at risk. Obviously, that situation is wrong. Why should everyone have to study the same subject to protect themselves? It’s like asking everyone to become an expert on automobile mechanics to protect themselves from badly designed cars, and study aerodynamics to protect themselves from badly designed airplanes, and study…. Well, you get the idea. It’s an idea that just doesn’t scale. It may seem to work for one thing, but it breaks down quickly when you try to apply it as a general principle. And it’s that lack of general applicability that exposes the flaw in the notion of “personal responsibility”, as espoused by corporate apologists. Refined sugar just naturally adds to your weight, because it consists of “empty calories”—carbohydrates your body converts to fat without any of the minerals or other nutrients your body needs, so you are continually hungry for more. We all know that empty calories are “bad”. But high fructose corn syrup gives that term a whole new level of meaning. Fructose does not appear to suppress the production of ghrelin, a hormone that increases hunger and appetite. But with high fructose corn syrup, there is no limit. You can guzzle sodas all day, and as soon as your empty your bladder, you can come back for more. It’s no wonder that kids are so big these days. It’s no wonder that baggy pants and sweatshirts are now fashionable — they hide the fat. 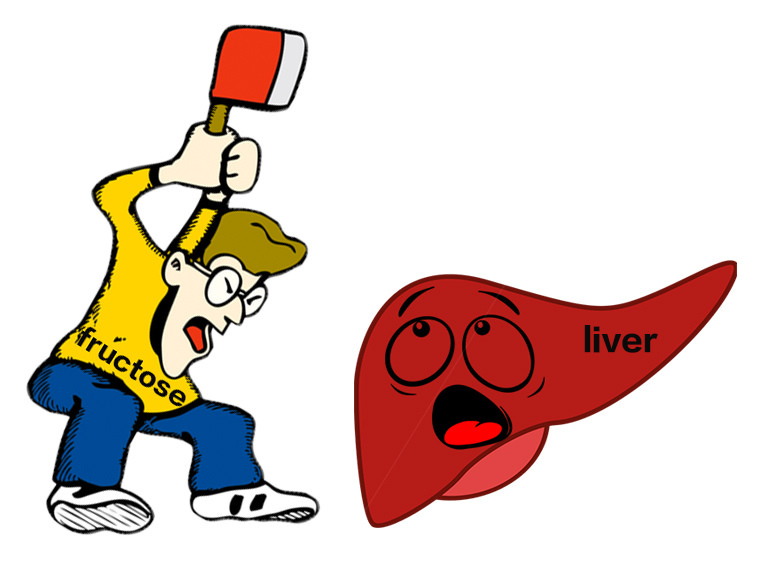 Fructose is converted to fatty acids by the liver at a greater rate than is glucose. The thyroid is your “energy gland”. When it’s operating properly, you have lots of energy, you’re active, and you burn fat. When it’s not operating properly, you’re sluggish, you lie around, you eat more in a vain attempt to get energy, and you put on fat. Corn oil, like soybean oil, depresses the thyroid. High Fructose Corn Syrup does so as well. It is an open question whether its anti-thyroid effect results from the fact that it is a corn product, or because it contains high levels of fructose. But whether it comes about as a result of the fructose content or because it’s made from corn (or both), it’s clear that high fructose corn syrup reduces thyroid function. It’s immaterial whether it does so because it contains high levels of fructose or because it’s derivative of corn oil. Either way, it makes you burn less fat and put on weight. When you know what to look for, and you start reading labels, it’s astonishing. High Fructose Corn Syrup is the sweetener of choice for nearly everything in the supermarket, from salad dressing to pastrami. That makes it really difficult to avoid. So I read labels carefully, and avoid American fast foods. Saccharine has a bad after-taste and a tendency to cause cancer. Aspartame breaks down into formaldehyde. Remember that stinky stuff in biology lab that preserved all the specimens? That was formaldehyde. Want to drink it? I don’t think so. Enough said. Sucralose/Splenda is a chlorinated compound produced in a laboratory that has displayed evidence of toxicity. Everyone of them represents yet another way that massive food corporations take your money with massive marketing campaigns designed to make you think you’re doing something good for yourself. So far, those sweeteners appear to be non-threatening, and even healthy. The best introduction I’ve found is a guide to healthy sweeteners entitled, Put some healthy sweetness in your life! Fortunately, the Whole Foods chain has stores in my area. I get virtually all of my food there — and I still read the labels. I mostly get toilet paper and paper towels at the grocery store down the block. I drive several miles to get real food. I go about once a week, spent a couple of hundred dollars, and stock up for the week. I’d rather spend it here than in the hospital. That’s a slogan that has real meaning for me. When I was 11, I spent the next two years visiting my mother in the hospital. She was in and out, off and on. But I vividly recall the obligatory trips to visit. They weren’t fun, because all there wasn’t much to do besides talk. I didn’t know it at the time, but she was dying of cancer. So she wan’t able to be the fun person who used to do stuff with me. That was a formative time in my life. I also recall a time when I was 8, and I started to see her exercising. That was something I had never seen before. Her diet started changing, too. Lots of grapefruit and bran. A few years later, she was in the hospital. I didn’t put it all together at the time, but somewhere in my unconscious, I made the connection. Those events produced a lifelong interest in fitness in nutrition. I began studying the subject in high school, and have been reading ever since. I’ve studied vitamins and minerals, amino acids, enzymes, anti-oxidants, and phytochemicals. Finally, I got to fatty acids, and when I put 2 and 2 together I created the TreeLight Health site and posted a paper on partially hydrogenated oils. That was in 1998. Since then, I’ve continued my investigations (all in my spare time) and whenever I’ve put enough information together to have something useful to say, I’ve posted another article. So for me, healthy living is a lifestyle choice. It’s something I do because, internally, I have very little real choice. It takes time and effort to learn what I need to know and read labels, but it’s necessary — because the billions the corporations spend to lobby our government means that our health interests are not adequately represented in the halls of government. For more, see What’s Wrong with Fructose?, which explains that the FDA does not regulate substances that produce chronic, long-term disease. They are concerned solely with things that produce acute disease. In other words, if it doesn’t disable you immediately, it’s not covered by the FDA’s charter. In short: There are multiple hazardous substances in the American food supply are not covered by any regulations, whatever. Put some healthy sweetness in your life!